Beyonce in her first scintillating performance at Revel Beach Ovation Hall in Atlantic City she looked stunning. She was overjoyed with here weight loss efforts and shared here joy with here fans. We tracked Beyonce’s weight loss journey through here pregnancy. Have a look! Beyonce first announced her pregnancy at the MTV’s Video Music Awards, August 2012. Husband Jay-Z and Beyonce were expecting their first child in spring this year. The mum to be was in perfect bliss as she showed here baby bump at award function. 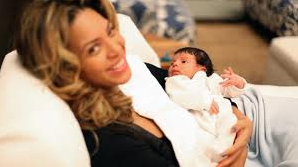 Quashing all rumors about fake baby bump, Beyonce was glowing after their baby girl was born earlier in January, 2012, This up-close snap of the mom and new born, Blue Ivy Carter captured the real essence. Beyonce Knowles first post baby outing was made for her husband Jay-Z at his Carnegie Hall concert in Manhattan, just after four weeks after pregnancy. Here curvaceous body still looked a bit out of shape. However, Beyonce stole the show by wearing a hot red Alice by Temperley. Blue Ivy’s first outing after birth too made headlines. But mom looked still out of shape, though all the baby fat hid cleverly behind the black color. Beyonce Knowles looked like she was gaining here pre pregnancy shape, as she was spotted at the fundraiser event hosted by First Lady, Michelle Obama. She wore a body hugging blue Victoria Beckham dress to flaunt her flat stomach and curves after just two months post pregnancy. So when Beyonce performed this weekend showing off her perfect body post pregnancy she was not afraid to share here weight loss experience with her fans. Proud of her efforts she ahs lost 60lb baby fat, which was not an easy journey. Elated with her weight loss efforts Beyonce added, “I lost most of my weight from breast-feeding and I encourage women to do it; it’s just so good for the baby and good for you,” she told People magazine. Cheers to the proud mom for losing weight beautifully!